University of California Press, 9780520255159, 320pp. In this riveting book, authors and authorities on modern day slavery Kevin Bales and Ron Soodalter expose the disturbing phenomenon of human trafficking and slavery that exists now in the United States. In The Slave Next Door we find that slaves are all around us, hidden in plain sight: the dishwasher in the kitchen of the neighborhood restaurant, the kids on the corner selling cheap trinkets, the man sweeping the floor of the local department store. In these pages we also meet some unexpected slaveholders, such as a 27-year old middle-class Texas housewife who is currently serving a life sentence for offences including slavery. 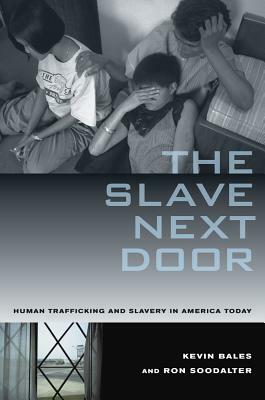 Weaving together a wealth of voices--from slaves, slaveholders, and traffickers as well as from experts, counselors, law enforcement officers, rescue and support groups, and others--this book is also a call to action, telling what we, as private citizens, can do to finally bring an end to this horrific crime. Kevin Bales, President of Free the Slaves in Washington, D.C. (www.freetheslaves.net) and Professor of Sociology at Roehampton University London in England, is the author of Disposable People: New Slavery in the Global Economy and Understanding Global Slavery (both from UC Press), among other books. Ron Soodalter, historian, folklorist, and lecturer, is the author of Hanging Captain Gordon: The Life and Trial of an American Slave Trader, as well as articles on the historic and modern slave trade, the Civil War, and the American West. A respected Lincolnian scholar, he serves on the Board of the Abraham Lincoln Institute.